Outside The Stones, Stewart famously pounds the keys on Led Zeppelin’s Little Richard style rave-up “Rock N Roll”, and is named in their “Boogie with Stu” from the “Physical Graffitti” album. He was also part of the stellar studio band during the “Howlin’ Wolf London Sessions”, that’s him on “Sitting On Top of the World”. “Boogie 4 Stu” is pianist Ben Waters’ tribute to Stewart (who passed away in 1985) and the music he loved to play. Waters was struck with woogie-boogie flu at a young age, not only seeing Stewart play live but witnessing a summit of Ray Charles, Jerry Lee Lewis and Fats Domino at Domino’s 60th birthday gig. “When I decided to make this album for Stu I hadn’t got any big plans. I just wanted to say thanks to him”, says Waters in the liner notes. He was pleasantly surprised when a boatload of Ian’s friends, admirers and fellow musicians offered to be involved, including every member of the The Rolling Stones, Jools Holland and P.J. Harvey. Waters and company offer a tight little set of boogie and jump based tunes by Albert Ammons, Big Maceo, Big Joe Turner and Amos Milburn. Polly Jean does a moody multi-tracked vocal on Doc Pomus’s “Lonely Avenue”. Keith and Ronnie Wood get in lead vocals on “Worried Life Blues”, and all of the Stones convene on Dylan’s “Watching The River Flow”. Though recorded in various studios around the world and under varying circumstances (Jagger literally emailed his vocal in) veteran producer/engineer Glyn Johns pulls the project together with a mix that does not reveal its pastiche origins. In fact it feels like it was all put together in one room during an afternoon session. 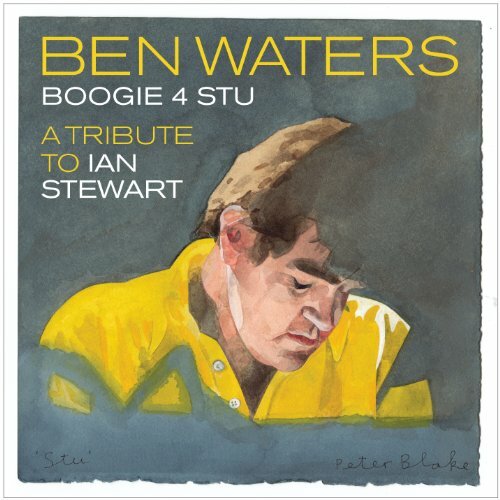 With its lovely watercolor cover by artist Peter Blake (Sgt Pepper’s, Face Dances) “Boogie 4 Stu” does Ian Stewart’s memory proud. If it sends you looking for a listen to the music of his influences and mentors it succeeds well beyond its humble beginnings. The final track features the man himself with his stage band Rocket 88 and makes me very curious about what Stewart gems would appear should a Beatles style “anthology” ever emerge from the Rolling Stones’ vaults. A “Jamming with Edward” type compilation of Stu based tracks seems like a no-brainer. In the meantime, we don’t have to pipe dream to enjoy Waters’ fine tribute. Proceeds from the sale of this disc will go to the British Heart Fund.